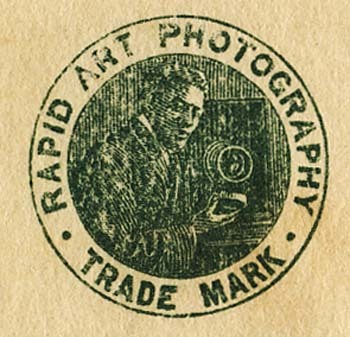 [ABOVE] The trade mark of the Rapid Art Photography (R. A. P.) company, as printed on the reverse of a postcard portrait (c1907). The Rapid Art Photography (R. A. P.) company was established around 1907 by a photographer named De Jornette Plummer. 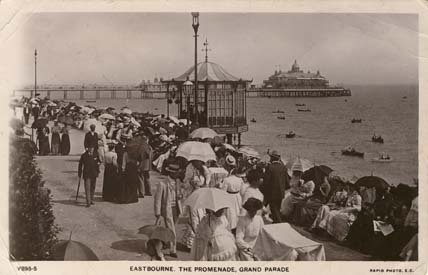 Previously, De Jornette Plummer had worked as a photographer on Brighton's Palace Pier and had produced photographic picture postcards imprinted with the name "American Art Rapid Photography". De Jornette Plummer had probably arrived in England from the continent around 1901. [ I cannot trace De Jornette Plummer in the English census returns produced between 1861 and 1901]. In 1902, in the London district of Marylebone, De Jornette Plummer married Madame Hortense Loretz (formerly Hortense Sober). [The marriage of De Jornette Plummer and Hortense Loretz was registered in the London district Marylebone during the 2nd Quarter of 1902]. De Jornette Plummer's wife was born Hortense Sober in the Belgian city of Brussels around 1864. At the age of eighteen, Hortense Sober (born c1864, Brussels, Belgium) had married Carl Prosper Loretz. [The marriage of Carl Prosper Loretz and Hortense Sober was registered in the Strand district of London during the 2nd Quarter of 1881]. Twenty years later, Madame Loretz was free to marry again. Madame Hortense Loretz, then in her late thirties, married De Jornette Plummer, who was at that time conducting experiments in photography. In the early 1900s, De Jornette Plummer was based at 43 Southampton Buildings, Chancery Lane, London. In 1903, the trade journal "The Photographic Dealer" reported that De Jornette Plummer had introduced "a new or improved photographic or printing frame". By 1903, De Jornette Plummer had set up a photographic stall on Brighton's Palace Pier, where he took souvenir portraits of holiday makers which were presented in the recently introduced "picture postcard" format. De Jornette Plummer was producing picture postcards before the "divided back" had taken off commercially. 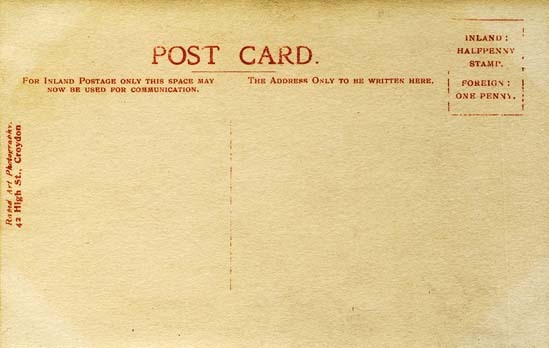 (Until January 1902, postal regulations stipulated that one side of the picture postcard had to be reserved for the postage stamp and the name and address of the recipient and therefore any messages had to be written on the picture side of the photograph). The early souvenir photographic portraits produced at Plummer's photographic stall on Brighton's Palace Pier, occupied less than half the surface area of the "picture side" of the postcard. The majority of the space on the "picture side" was left clear to allow the sender to write a message to the recipient of the postcard. 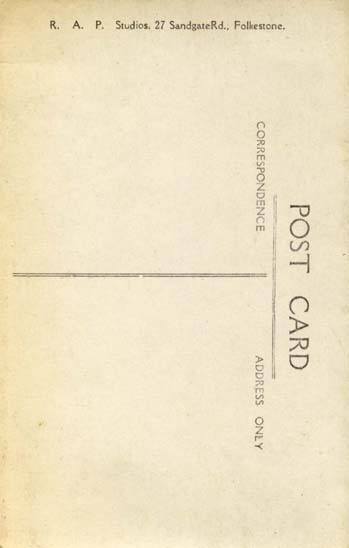 However, by 1904, De Jornette Plummer was producing picture postcards with "divided backs", so that the whole of one side of the card could be covered by a photographic print. Plummer's early picture postcards carried the picture credit "Brighton Palace Pier - American Art Rapid Photography", but by 1907, De Jornette Plummer had established a company called Rapid Art Photography (R. A. P.) Galleries, setting up branches in Brighton, Hastings and Eastbourne. 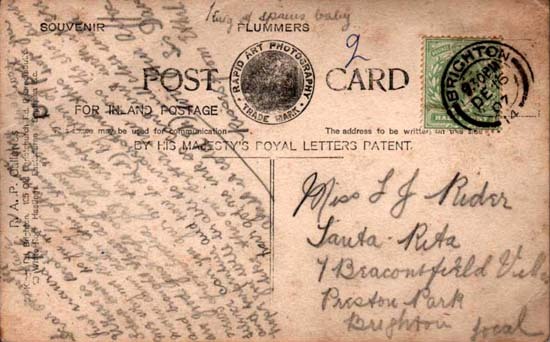 [LEFT] The printing on the reverse of a postcard portrait produced at De Jornette Plummer's R. A. P. (Rapid Art Photography ) Gallery at 59 King's Road, Brighton (c1907). 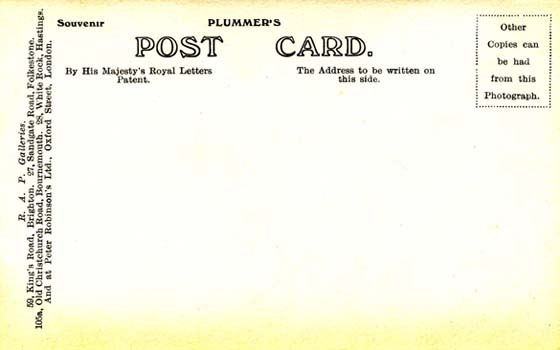 The postcards produced at the Brighton branch of R. A. P. (Rapid Art Photography ) often carry the heading "Plummer's Post Card". De Jornette Plummer opened the Brighton branch of Rapid Art Photography (R. A. P.) Galleries at 59 King's Road, Brighton around 1907. Shortly afterwards, D. J. Plummer recruited the German-born photographer Hans D. Prochnow (born c1880) to manage the Eastbourne branch of Rapid Art Photography (R. A. P.) at 56c Terminus Road, Eastbourne. During the same year, D. J. Plummer opened R. A. P. galleries in Hastings, Bournemouth and Southsea. Around 1910, De Jornette Plummer arranged for his wife, Madame Hortense Plummer (born 1864, Brussels, Belgium) to manage the R. A. P. Gallery at 28 White Rock, Hastings. [ABOVE] The five branches of the Rapid Art Photography (R. A. P.) Galleries as printed on the reverse of a picture postcard produced around 1915. Around this time, the R. A. P. (Rapid Art Photography) Galleries were based in Brighton, Folkestone, Bournemouth, Hastings and London. In the early years of the twentieth century, Rapid Art Photography had a studio in Croydon, Surrey. 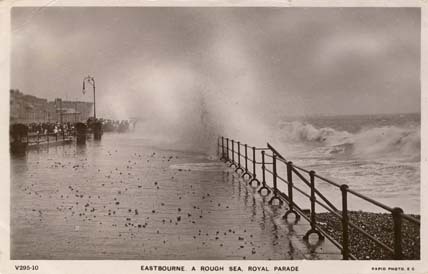 Around 1910, a Rapid Art Photography (R. A. P.) gallery was opened in Eastbourne under the management of Hans Detlof Prochnow, a photographer from Germany. The Croydon branch was short-lived and the R.A.P. Gallery in Eastbourne closed around 1914. The Rapid Art Photography (R. A. P.) Galleries appear to have closed in 1919 with the death of Madame Hortense Plummer, the wife of the company's founder De Jornette Plummer. [The death of Hortense Plummer was registered in the district of Hastings during the 1st Quarter of 1919]. Madame Hortense Plummer's R. A. P. studio at 28 White Rock, Hastings was last listed in the 1918 edition of Kelly's "Directory of Sussex". A year or so after his wife's death, De Jornette Plummer married Edith Mary Metters (born 1890, Hampstead, London), a professional photographer and the daughter of Caroline and John Metters, a warder at Wandsworth Prison. [The marriage of De Jornette Plummer and Edith M. Metters was registered in the St Pancras district of London during the 3rd Quarter of 1920]. It is possible that De Jornette Plummer and Edith Mary Metters were living as man and wife before the death of Madame Hortense Plummer in 1919. A photographer named "Mrs Edith Plummer" appears in Liverpool trade directories published between 1917 and 1920 with studios at 35 Moorfields, Liverpool and 95 West Derby Road, Liverpool. Presumably, De Jornette Plummer and Miss Edith M Metters had to wait for the death of Plummer's first wife before marrying in 1920. 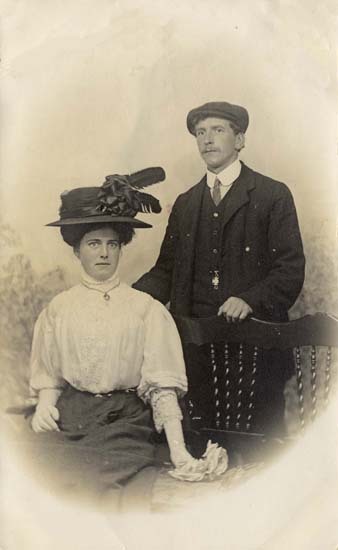 After their marriage, De Jornette Plummer and his new wife returned to Liverpool, where they established a new photographic business - Princess Dubarries Portrait Studios Limited. According to The British Journal of Photography, on 6th May 1921, the private company of Princess Dubarries Portrait Studios Ltd. was registered "to carry on the business of photographers and photographic artists, dealers in photographic goods, apparatus, chemicals and materials, etc." The directors of the Princess Dubarries Portrait Studios were given as Mrs Edith Plummer and De Jornette Plummer of 103 Bedford Street South, Liverpool. It seems that De Jornette Plummer disappeared from the scene before 1924. De Jornette Plummer might have died or simply abandoned his wife. In 1922, The British Journal of Photography reporting on Plummer's photographic business, states that Mrs Edith Plummer of 103 Bedford Street South, Liverpool, was "the sole director for life". On 25th September 1922, at an Extraordinary Meeting of the Shareholders of the Princess Dubarries Portrait Studios Ltd. it was proposed "that the Company be wound up voluntarily". Mrs Edith Plummer died in Hampstead, London in 1946, aged 56. [The death of Edith M. Plummer was registered in the North London district of Hampstead during the 3rd Quarter of 1946]. I have not traced a record of the death of De Jornette Plummer in English death registrations, so he might have returned to Europe during the 1920s. [ABOVE] A postcard portrait of a woman wearing a fancy hat and feather boa, photographed at one of the studios of the Rapid Art Photography (R. A. P.) company (c1907). When this photograph was taken Rapid Art Photography (R. A. P. Galleries) had branches in Brighton, Hastings, Bournemouth and Eastbourne. [ABOVE] De Jornette Plummer and Hans D. Prochnow recorded in the list of professional photographers in the 1909 edition of Kelly's Directory of Sussex. D. J. Plummer operated the R. A .P. Gallery at 59 King's Road, Brighton, and H. D. Prochnow managed the R. A .P. Gallery at 56c Terminus Road, Eastbourne. [ABOVE] De Jornette Plummer recorded as the proprietor of the R. A .P. Gallery at 59 King's Road, Brighton and his wife Madame Hortense Sober Plummer listed as a photographer at Hastings branch of R. A. P. Galleries at 28 White Rock, Hastings in the 1911 edition of Kelly's Directory of Sussex. The Eastbourne R.A.P. Gallery at 56c Terminus Road, managed by Hans D. Prochnow, is not listed in the 1911 trade directory. [ABOVE] A public notice in The London Gazette published on 13th May 1924, summoning De Jornette Plummer to a Court Hearing in the Government Buildings in Victoria Street, Liverpool. This is one of the last mentions of De Jornette Plummer as a professional photographer in Liverpool. [ABOVE] The reverse of the picture postcard portrait shown opposite, produced at the American Art Rapid Photography stall on Brighton's Palace Pier . 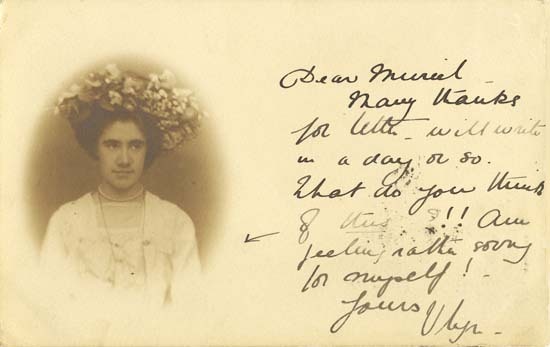 This postcard, which is postmarked 7th September (1902 or 1903) was sent by "V. Lyn." 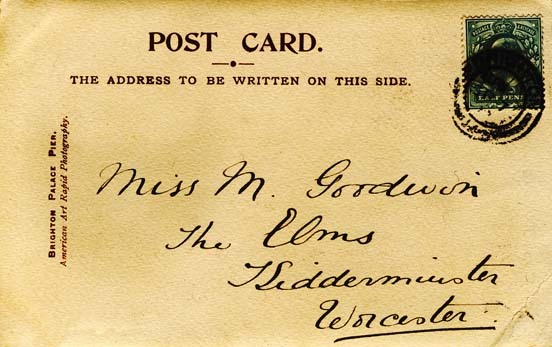 to Miss M. Goodwin, The Elms, Kidderminster, Worcester. 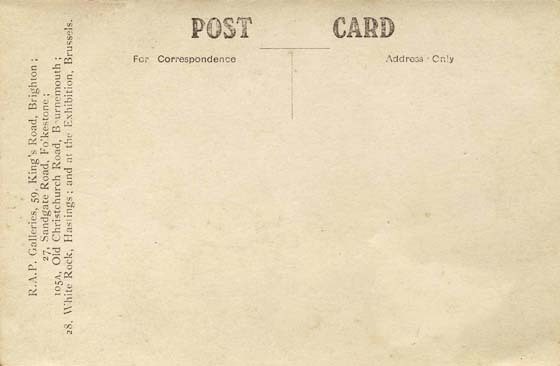 In the period 1902-1903 messages were generally written on the picture side of the postcard and the side which carried the postage stamp was reserved for the postal address. This postcard is credited to "Brighton Palace Pier; American Art Rapid Photography". [ABOVE] "The Angry Sea" at Brighton, a postcard produced by American Art Rapid Photography Palace Pier, Brighton (Postmarked 9th September 1904). The photograph of the high waves hitting the East Street Groyne was taken by D. J. Plummer from Brighton's Palace Pier. The photograph is marked "Copyright Photo. Plummer". 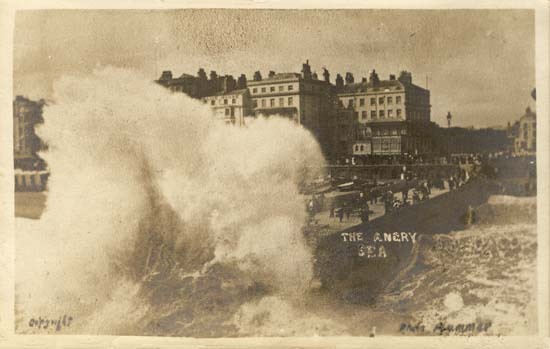 [ABOVE] The reverse of the picture postcard entitled "The Angry Sea" produced by American Art Rapid Photography, then based at Brighton's Palace Pier. This postcard, which is postmarked 9th September 1904, was sent by "E. F. B." to Miss Kilburn of 71 Sheep Street, Northampton. The postcard is credited to "Brighton Palace Pier; American Art Rapid Photography". 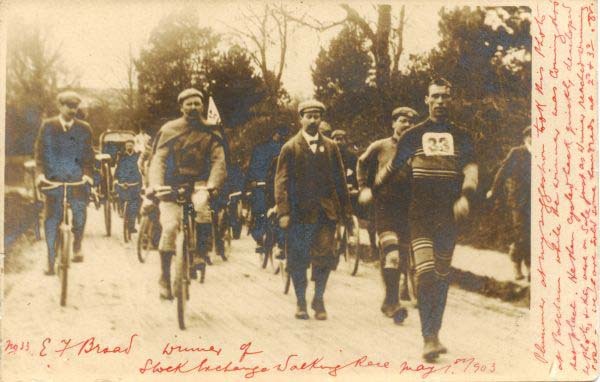 [ABOVE] A picture postcard produced in 1903 by the American Art Rapid Photography company showing Mr E. F. Broad, the winner of the First Stock Exchange Walking Race, striding through Patcham on the outskirts of Brighton on 1st May 1903. Writing in red ink on the postcard itself, George Sones, a retail stationer with a shop at 112 North Street, Brighton, described how the Brighton photographer De Jornette Plummer took this shot of Mr Broad as he walked through Patcham, and then cycled back to Brighton, where he developed the photograph and printed copies on hundreds of postcards. According to George Sones, the souvenir postcards celebrating Mr Broad's victory were available for sale as soon as the walker crossed the finishing line. 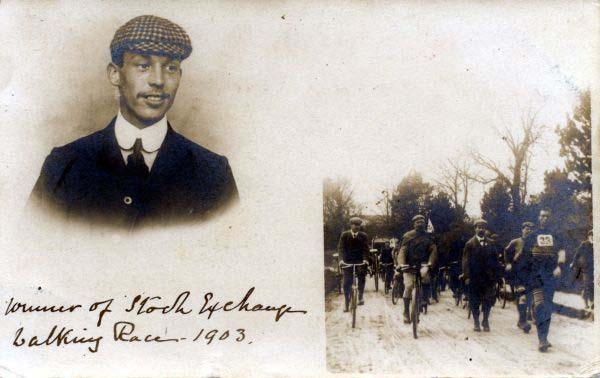 [ABOVE] A picture postcard produced in 1903 by the American Art Rapid Photography company featuring a vignetted portrait of Mr E. F. Broad, the winner of the First Stock Exchange Walking Race which took place between London and Brighton on 1st May 1903. Mr E. F. Broad, a clerk with a stock broking company, completed the 52 mile walk in 9 hours, 30 minutes, 1 second. The picture postcards in this panel come from the postcard collection of Rendel Williams, who has made a special study of postcards published in Sussex and is the creator of the excellent Sussex Postcards.Info website. The photographic artist and innovator De Jornette Plummer set up a photographic stall on Brighton's Palace Pier in 1902 or 1903. On the recently constructed pier (The Palace Pier had been opened to the public on 20th May 1899), De Jornette Plummer spent most of his time taking souvenir portraits of holiday makers, which were presented in a "picture postcard" format. D. J. Plummer's "Palace Pier" postcards featured a vignetted photographic portrait alongside a space reserved for a written message. 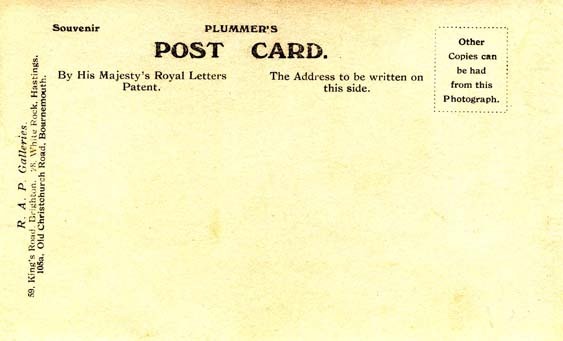 (Plummer was producing photographic picture postcards before the general introduction of "divided back" cards, which allowed the whole of one side to be covered by a photograph or illustration). In between taking his "Palace Pier Portraits", De Jornette Plummer found time to take photographs of various pier entertainers and sell the resulting pictures as souvenir postcards. These early postcards, dating from 1902 and 1903, are printed with the photo credit "Brighton Palace Pier; American Art Rapid Photography". D. J. Plummer's Postcards of "E. F. Broad winning the Stock Exchange Walking Race" and "Mademoiselle Florence Walking the Globe"
Plummer at my suggestion took this photo at Patcham while the winner was coming thro' that place, he then cycled back quickly, developed the photo & they were on sale just as winner reached winning post. We have sold some hundreds at 2d & 3d. In June 1903, De Jornette Plummer was provided with another opportunity to produce a picture postcard that could be sold in its hundreds. Mademoiselle Florence, an acrobatic entertainer from the United States, proposed to travel from London's Westminster Bridge to the Aquarium on Brighton's seafront, by balancing on a large stone ball or globe and propelling it along the 52 mile route with her feet. Billed as "The Lady Globe Walker", Mademoiselle Florence travelled a distance of 52 miles from London to Brighton, completing the journey in less than four days. 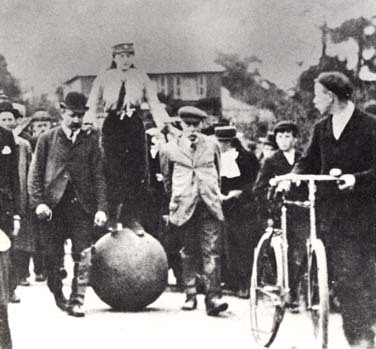 De Jornette Plummer joined Mademoiselle Florence somewhere on the London-Brighton Road to photograph her balancing on the large stone globe, surrounded by spectators and supporters. De Jornette Plummer later published his photographs in a series of picture postcards. Rendel Williams has a picture postcard in his collection entitled "Walking the Globe, London to Brighton. Mdlle Florence on the Globe". This card was published by Plummer's Rapid Art Photography company in 1903 and carries the words "Copyright, R. A. P." This photo credit suggests that D. J. Plummer changed the name of his firm from "American Art Rapid Photography" to R. A. P. (Rapid Art Photography) as early as the Summer of 1903. After the success of the "Stock Exchange Walking Race" and "Walking the Globe" picture postcards, De Jornette Plummer established a company called Rapid Art Photography (R. A. P.) and set up photographic portrait studios in Brighton, Hastings, Bournemouth and Eastbourne. [ABOVE] The picture credit which appeared on the reverse of D. J. Plummer's early postcards (c1903). [ABOVE] The picture credit which appeared on D. J. Plummer's postcards after he changed the name of his business from American Art Rapid Photography to Rapid Art Photography, later abbreviated to R. A. P. (c1908). [ABOVE] Mr E. F. Broad photographed at Crawley as he takes the lead in the First Stock Exchange Walking Race between London and Brighton. 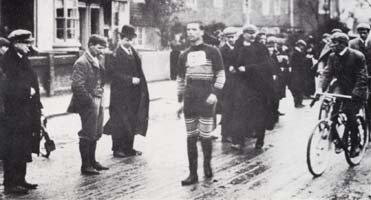 The walking race to Brighton took place on 1st May 1903. [ABOVE] A picture postcard entitled "Walking the Globe, London to Brighton. Mdlle Florence on the Globe" which was published in 1903 by R. A. P. (Rapid Art Photography). 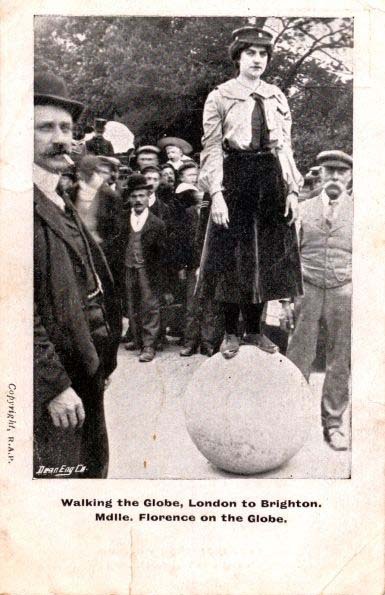 The above picture, which was probably taken by the Brighton photographer De Jornette Plummer, shows Mademoiselle Florence balancing on the "Globe", a stone ball two feet in diameter and weighing 75 pounds. 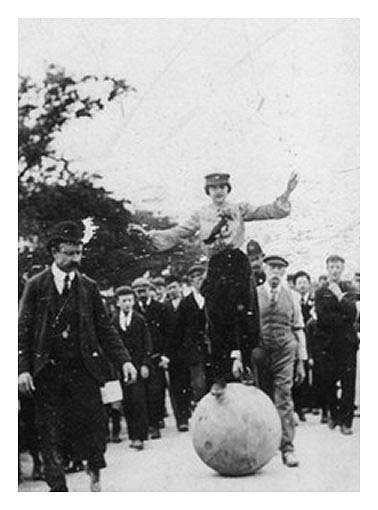 Mademoiselle Florence, who was variously described as "The Lady Globe Walker" and the "Champion Globe Walker of the World", travelled a distance of 52 miles from London to Brighton, balancing on the rolling ball. The journey took 3 days and 22 hours to complete, with Mademoiselle Florence arriving at the Brighton Aquarium at 2.45 a.m. in the early hours of Sunday, 21st June, 1903. De Jornette Plummer, the founder of R. A. P. (Rapid Art Photography) later published a number of picture postcards celebrating Mademoiselle Florence's impressive feat of endurance. 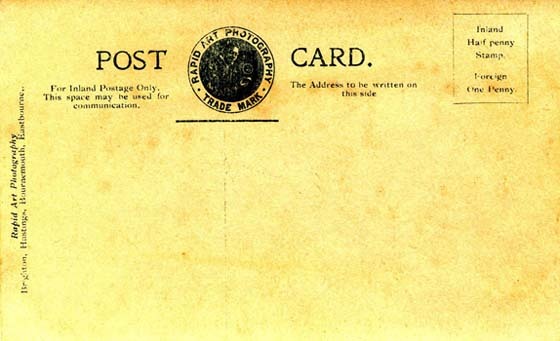 The words "Copyright, R. A. P. " are printed on the border of the picture postcard. [ABOVE] Another photograph of Mademoiselle Florence "walking on the Globe" on the 52 mile journey between London and Brighton in June 1903. According to contemporary newspaper articles, Mademoiselle Florence dismounted at each milestone and was allowed 3 hours rest each day. One newspaper reported that Mademoiselle Florence wore out 7 pairs of boots during the four-day "Globe Walk". The previous month, the Brighton photographer De Jornette Plummer had made a pictorial record of the First Stock Exchange Walking Race which took place between London and Brighton on 1st May 1903. [ABOVE] A photograph of Mademoiselle Florence, supported by two helpers, setting off on the last stage of her "globe walking" journey to Brighton (June 1903). My thanks to Rendel Williams who has generously allowed me to feature the American Art Rapid Photography and R. A. P. picture postcards from his Sussex postcard collection. Rendel Williams is the creator of the excellent Sussex Postcards.Info website. [ABOVE] A postcard portrait of an unknown man, probably photographed at D. J. Plummer's R. A. P. (Rapid Art Photography) Gallery at 59 King's Road, Brighton, (c1914). The reverse of this picture postcard also gives details of the R. A. P. Galleries at 28 White Rock, Hastings, 105a Old Christchurch Road, Bournemouth, 27 Sandgate Road, Folkestone and at Peter Robinson's Ltd., Oxford Street, London. 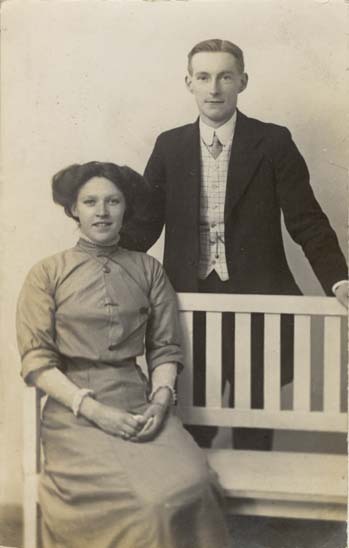 [ABOVE] A postcard portrait of a man and his wife, probably photographed at D. J. Plummer's R. A. P. (Rapid Art Photography) Gallery at 59 King's Road, Brighton, (c1908). The reverse of this picture postcard also gives details of the R. A. P. Galleries at 28 White Rock, Hastings and 105a Old Christchurch Road, Bournemouth. [ABOVE] A postcard portrait of a four young women, photographed at one of the R. A. P. (Rapid Art Photography) Galleries (c1915). The printed publicity on the reverse of this picture postcard gives details of four well-established R. A. P. Galleries - 28 White Rock, Hastings, 59 King's Road, Brighton, 27 Sandgate Road, Folkestone, and 105a Old Christchurch Road, Bournemouth, plus one temporary gallery set up in Belgium at an Exhibition Hall in Brussels. [ABOVE] A postcard portrait of a young man, probably photographed at D. J. Plummer's R. A. P. (Rapid Art Photography) Gallery in Brighton, either at 59 King's Road, Brighton, or 13 East Street, Brighton (c1909). The reverse of this picture postcard also gives details of the R. A. P. Galleries at 28 White Rock, Hastings,27 Sandgate Road, Folkestone and 105a Old Christchurch Road, Bournemouth [ABOVE] A postcard portrait of two girls and their brother, probably photographed at D. J. Plummer's R. A. P. (Rapid Art Photography) Gallery at 59 King's Road, Brighton, (c1914). The reverse of this picture postcard also gives details of the R. A. P. Galleries at 28 White Rock, Hastings, 105a Old Christchurch Road, Bournemouth, 27 Sandgate Road, Folkestone and at Peter Robinson's Ltd., Oxford Street, London. 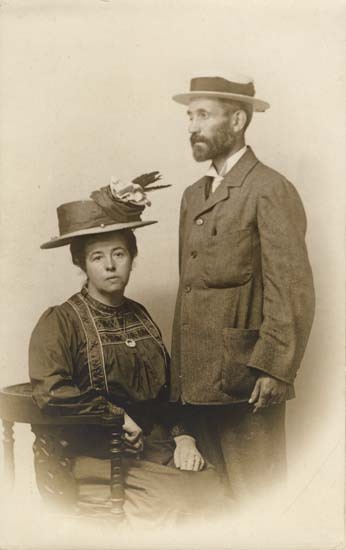 [ABOVE] A postcard portrait of a man and his wife, probably photographed at D. J. Plummer's R. A. P. (Rapid Art Photography) Gallery at 59 King's Road, Brighton, (c1908). The reverse of this picture postcard also gives details of the R. A. P. Galleries at 28 White Rock, Hastings and 105a Old Christchurch Road, Bournemouth. As with other portrait cards produced at D. J. Plummer's studio in Brighton, the reverse carries the printed legend "Plummer's Post Card". [ABOVE] The reverse of a postcard portrait taken at D. J. Plummer's Rapid Art Photography studio at 59 King's Road, Brighton, (c1907). A list of the towns hosting a Rapid Art Photography studio - Brighton, Hastings, Bournemouth and Eastbourne - is printed on the left-hand side of the card. [ABOVE] The reverse of a postcard portrait taken at D. J. Plummer's R. A. P. (Rapid Art Photography) Gallery in Brighton (c1908). 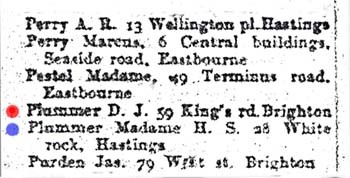 Printed on the left-hand side are the studio addresses of the three R. A. P. Galleries operating In England at that time - 59 King's Road, Brighton, 28 White Rock, Hastings and 105a Old Christchurch Road, Bournemouth. [ABOVE] The reverse of a postcard portrait taken at D. J. Plummer's R. A. P. (Rapid Art Photography) Gallery at 59 King's Road, Brighton, (c1914). Printed on the left-hand side are details of other R. A. P. Galleries at 27 Sandgate Road, Folkestone, 105a Old Christchurch Road, Bournemouth, 28 White Rock, Hastings and at Peter Robinson's Ltd., Oxford Street, London. [ABOVE] The reverse of a postcard portrait taken at D. J. Plummer's R. A. P. (Rapid Art Photography) Gallery at 59 King's Road, Brighton, (c1915). Printed on the left-hand side are details of other R. A. P. Galleries at 27 Sandgate Road, Folkestone, 105a Old Christchurch Road, Bournemouth, 28 White Rock, Hastings and at an Exhibition Hall in Brussels, Belgium. [ABOVE] The reverse of a postcard portrait taken at D. J. Plummer's Rapid Art Photography studio at 59 King's Road, Brighton, (1907). Details of the R. A. P. (Rapid Art Photography) Galleries in Brighton, Bournemouth, Hastings, Eastbourne and Southsea are printed on the left-hand side of the card. The postcard, which carries a photographic portrait of 10 month old Ethel Rider was sent by the baby's mother, Elizabeth "Daisy" Rider, to her sister Miss Louisa Jane Rider, a domestic servant working at "Santa Rita", 7 Beaconsfield Villas, Preston Park, Brighton. 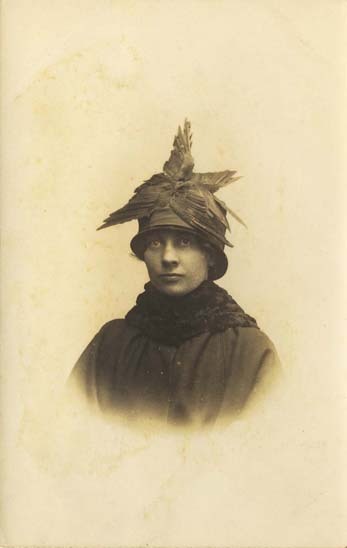 Ethel Rider was born on 26th January 1907 at the Infirmary attached to the Elm Grove Workhouse, Elm Grove, Brighton. [Although her registered name was Annie Ethel Rider, throughout her life she was known by family and friends as "Ethel"]. (Annie) Ethel Rider's birth certificate states she was born at 250 Elm Grove, Brighton, an address which was used to disguise the fact that she was born in the workhouse infirmary - a registration practice which began in 1904 to protect children from discrimination in later life. Ethel Rider's mother was Elizabeth ("Daisy") Charlotte Rider (born 1884, Brighton), a twenty-three year old domestic servant, the youngest daughter of Sarah Ann Handley and William Rider, a master baker of Albion Hill, Brighton. Sarah Ann Handley (Elizabeth "Daisy" Rider's mother), had been born in Lambeth, South London, on 9th June 1853. After Sarah Ann Handley married Brighton-born baker William Rider in 1877, she, together with her husband and children, settled in Brighton. Elizabeth "Daisy" Rider's father, William Rider, died in Brighton, at the age of 40, in 1884, when "Daisy" Rider was still a young baby. Daisy's widowed mother, Mrs Sarah Ann Rider, found employment as a laundry worker with her mother Mrs Sarah Jane Handley (born c1827, London). 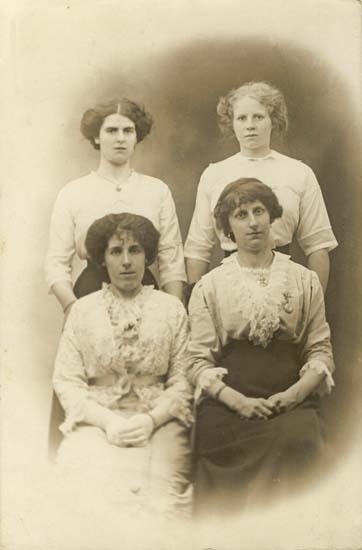 As teenagers, Elizabeth "Daisy" Rider and her sister Louisa Jane Rider (born 1880) were obliged to go into domestic service. Elizabeth "Daisy" Rider later became the "common law" wife of farm labourer Hubert John Smallpiece (born 17th September,1888, Chessington, Surrey). A son, Hubert "Bert" Arthur Smallpiece was born in Cheam, Surrey in 1910, but Hubert Smallpiece senior did not officially marry Elizabeth "Daisy" Rider until 1927. During her cohabitation with Hubert Smallpiece, Elizabeth "Daisy" Rider gave birth to four more children - Ernest John "Jack" Smallpiece (born 1912), David Charles "Charlie" Smallpiece (born 1913), Kathleen Lillian "Lily" Smallpiece (born 1916) and William "Bill" Alfred Smallpiece (born 1920). Elizabeth "Daisy" Rider's husband Hubert John Smallpiece died in Tolworth, Surrey, on 4th April 1951, in his 63rd year. Mrs Elizabeth "Daisy" Smallpiece (formerly Elizabeth "Daisy" Rider) died in Tolworth on 10th March 1969, at the age of 85. Elizabeth Rider''s daughter Ethel Rider, who in 1907, at the age of 10 months, sat for her portrait at D. J. Plummer's Rapid Art Photography studio at 59 King's Road, Brighton, went on to marry and have children of her own. In 1929, under the name of "Annie Ethel Smallpiece", twenty-two year old Ethel married Thomas Gosden (born 5th June, 1901, Bisley, Surrey). Mrs Ethel Gosden became the mother of two sons - Norman Thomas Gosden (born 21st January 1930, Woking, Surrey ) and Robin Leonard Gosden (born 23rd October 1941,New Haw, Surrey). Mrs Ethel Gosden (formerly Ethel Rider/Smallpiece) died in Woking, Surrey, on 1st May 1982, at the age of 75. [ABOVE] The branches of the R. A. P. (Rapid Art Photography) Galleries in Brighton, Bournemouth, Hastings, Eastbourne and Southsea printed on the reverse of another copy of the postcard portrait of Ethel Rider produced in November 1907. [ABOVE] A postcard portrait of Ethel Rider (born 26th January 1907), photographed at D. J. Plummer's R. A. P. (Rapid Art Photography) Gallery at 59 King's Road, Brighton in November 1907, when she was 10 month's old.. 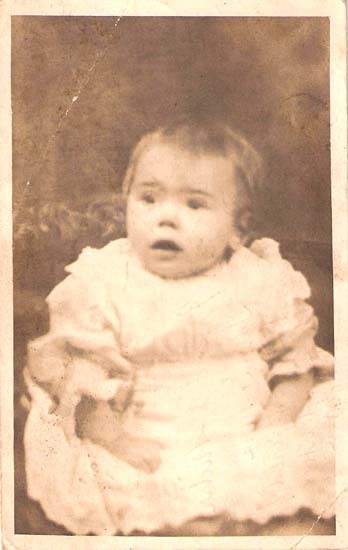 The postcard which carries this photograph of "baby Ethel", was sent by Ethel's mother, Elizabeth ("Daisy") Rider (born 1884, Brighton), to her sister Louisa Jane Rider (born 1880, Brighton). When Elizabeth "Daisy" Rider gave birth to her baby daughter. she was working as a domestic servant and living at 10 Whichelo Place, Brighton. Four years later, Elizabeth Rider was employed as a "Housekeeper" and boarding with an elderly widow Mrs Sarah Ratcliff at 2 Pottery Cottages, Cheam, Surrey, alongside her live-in partner Hubert John Smallpiece (born 17th September, 1888, Chessington, Surrey) and their one year old son Hubert Arthur Smallpiece. After giving birth to four more children, Elizabeth ("Daisy") Rider married her long term partner Hubert Smallpiece in 1927. 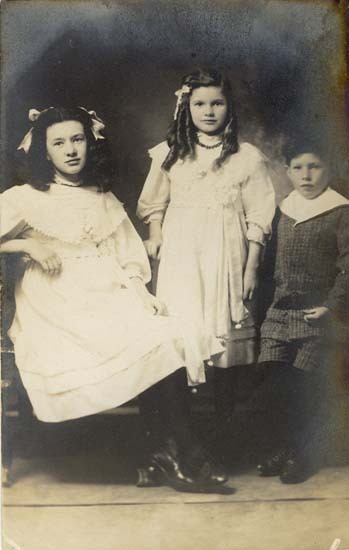 From around 1910, Ethel Rider, the baby in this picture, was generally known as "Ethel Smallpiece", taking the surname of her step-father, Hubert Smallpiece. On 27th April 1929, at Addlestone, Surrey, twenty-two year old Ethel Smallpiece married Thomas Gosden (born 1901, Bisley, Surrey). The union of Thomas Gosden and Ethel Smallpiece (Rider) produced two children - Norman Thomas Gosden (born 1930,Woking, Surrey) and Robin Leonard Gosden (born 1941, New Haw, Surrey). Mrs Ethel Gosden (formerly known as Ethel Rider or Ethel Smallpiece) died in Woking, Surrey, on 1st May 1982, at the age of 75. Thanks to Robin Gosden for providing the postcard portrait of his mother Ethel Rider and for information relating to the Rider Family of Brighton. 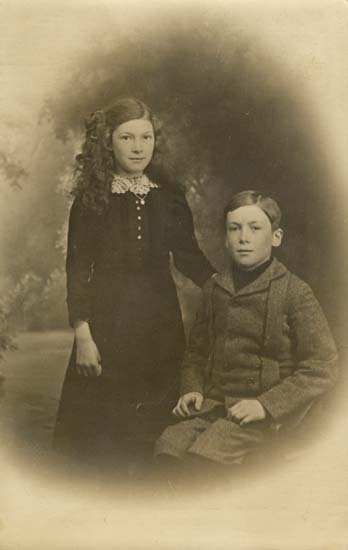 [ABOVE] A postcard portrait of a brother and sister, probably photographed around 1915 at the Hastings branch of R. A. P. (Rapid Art Photography) Galleries. The reverse of this picture postcard gives details of two R. A. P. Gallery studios, one at 28 White Rock, Hastings, the other at 105a Old Christchurch Road, Bournemouth. [ABOVE] The photo credit printed on the reverse of the postcard portrait illustrated above. Only two R. A. P. Gallery studios - 28 White Rock, Hastings and 105a Old Christchurch Road, Bournemouth - are mentioned. This postcard was probably produced around 1915 when R. A. P. (Rapid Art Photography) Galleries was in the hands of Madame Hortense Plummer (c1864-1919). [ABOVE] A postcard portrait of R. L. Mawhood photographed at the Hastings branch of R. A. P. (Rapid Art Photography) Galleries (1908). The reverse of this picture postcard gives the studio address of the R. A. P. Gallery as 28 White Rock, Hastings. The subject of the portrait is possibly Robert Leigh Mawhood (born 1882, Chelmsford, Essex), a Post Office Sorting Clerk and Telegraphist. 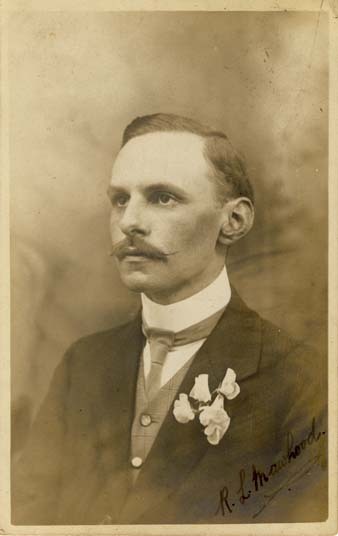 This portrait was probably photographed by H. H. Berden, who was based at 28 White Rock, Hastings between 1908 and 1909. From around 1910, the R. A. P. Gallery at 28 White Rock, Hastings was managed by Madame Hortense Plummer (c1864-1919), the wife of the company's founder De Jornette Plummer. The Brighton branch studio of R. A .P. was run by De Jornette Plummer. Madame Hortense Plummer managed the R. A. P. Gallery at 28 White Rock, Hastings from 1910 until her death in 1919. It appears that Madame Hortense Plummer and De Jornette Plummer separated around 1914. There is evidence that De Jornette Plummer had entered into a relationship with a young woman named Edith Mary Metters. Around 1915, De Jornette Plummer set up Edith Metters as a photographer in Liverpool. Edith Metters operated two studios in Liverpool under the name of "Mrs Edith Plummer" between 1917 and 1920, but the couple did not marry until 1920, a year after the death of Madame Hortense Plummer. The Hastings branch of R. A. P. (Rapid Art Photography) was opened in 1907 at 28 White Rock, Hastings. It appears that the Hastings studio of R. A. P. (Rapid Art Photography) was first occupied by a photographer named H. H. Berden. Although H. H. Berden is listed as a photographer at 28 White Rock, Hastings in a local trade directory published in 1909, the R. A. P. studio was under the management of Madame Hortense Plummer within a year or so. Madame Hortense Plummer had been born under the name of Hortense Sober in Brussels, Belgium, around 1864. In her late teens, Hortense Sober had married a man named Carl Prosper Loretz. [ The marriage between Hortense Sober and Carl Prosper Loretz was registered in the Strand district of London during the 2nd Quarter of 1882]. Carl Prosper Loretz was presumably a foreign national (the birth of a Charles Prosper Loretz was recorded in Obernai in the Bas-Rhin region of Alsace in north-eastern France in 1858). 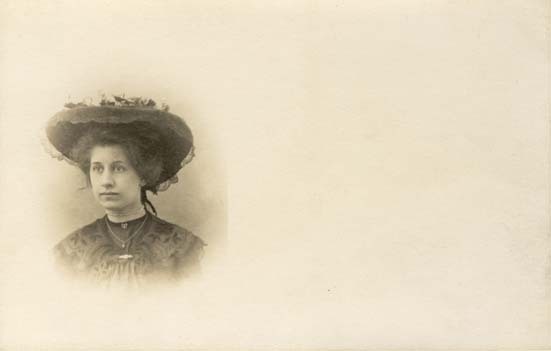 What happened to Carl Prosper Loretz is a mystery, but in 1902, Madame Hortense Loretz (formerly Hortense Sober) married the photographic artist and innovator De Jornette Plummer. [The marriage of De Jornette Plummer and Hortense Loretz was registered in the London district Marylebone during the 2nd Quarter of 1902 - the first name of Hortense's husband is recorded as "D'Jornette", so he too presumably originated from the European continent]. Around 1910, De Jornette Plummer arranged for his wife, Madame Hortense Plummer (born c1864, Brussels, Belgium) to take over the R. A. P. Gallery at 28 White Rock, Hastings. The 1911 edition of Kelly's Directory of Sussex records D. J. Plummer as the proprietor of the photographic portrait studio at 59 King's Road, Brighton (the Brighton studio of R. A. P.) and his wife Madame Hortense S. Plummer as the occupant of the R. A. P. (Rapid Art Photography) Gallery at 28 White Rock, Hastings. The 1911 census (which was taken on 2nd April 1911) records Hortense Plummer as a forty-seven year old "Photographer" boarding at Miss Rosette Stringer's Boarding House at 19 Cambridge Road, Hastings. Also residing at Miss Stringer's Boarding House was Oscar Sober (born c1871, Brussels, Belgium), presumably Madame Plummer's brother or cousin. Oscar Sober is described on the census return as a forty year old Photographer" so it is likely that Madame Hortense Plummer was assisted by Oscar at the Hastings branch studio of R. A. P. (Rapid Art Photography) at 28 White Rock, Hastings. Madame Hortense Plummer is recorded as the proprietor of the R. A. P. Gallery at 28 White Rock, Hastings up until 1918. 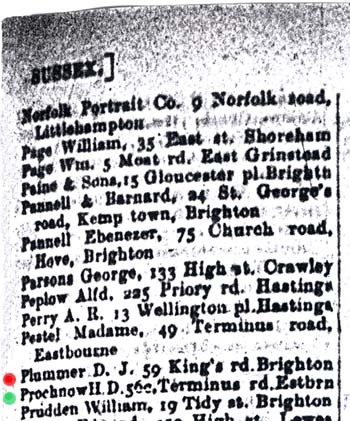 It appears that Hortense Plummer and her husband De Jornette Plummer had separated around 1914 and it is perhaps significant that, in 1915, the Brighton branch of Rapid Art Photography had closed and Mrs H. S. Plummer is listed as the proprietor of both the White Rock studio in Hastings and the R. A. P. Gallery at 105a Old Christchurch Road, Bournemouth. Both of these two remaining R. A. P. studios were closed after the death of Mrs Hortense Plummer in 1919. [The death of Hortense Plummer was registered in the district of Hastings during the 1st Quarter of 1919]. [ABOVE] Madame Hortense Sober Plummer recorded as the proprietor of the R. A .P. Gallery at 28 White Rock, Hastings in the 1911 edition of Kelly's Directory of Sussex. Madame Plummer's husband De Jornette Plummer is listed at the Brighton branch studio of R. A. P. (Rapid Art Photography). D. J. Plummer closed his studio at 59 King's Road, Brighton around 1914, eventually establishing a photographic business in Liverpool. Plummer's wife, Madame Hortense Sober Plummer managed the studio at 28 White Rock, Hastings up until her death in 1919. [ABOVE] A reverse of a postcard portrait produced at the Hastings branch of R. A. P. (Rapid Art Photography) Galleries in 1908. The studio address of the Hastings R. A. P. Gallery is given as 28 White Rock, Hastings. This postcard was sent by R. L. Mawhood to Miss E. E. Clark at 'Clare', Carisbrooke Road, St Leonards-on-Sea on 18th July 1908. The sender of the postcard Mr Mawhood, (who was staying at 10 Wellington Square, Hastings) writes: "Sending this as you specially wanted it, but must apologise for the terrible expression. Reminds one of "Convict 99" doesn't it? Sorry I am leaving so soon now. Kindest regards to yourself and all at 'Clare' .Good-bye, R. L. M." [ABOVE] A Victorian photograph showing the parade of shops at White Rock, Hastings, where R. A. P. Galleries had a branch studio between 1907 and 1919. The R. A. P. Gallery was located at 28 White Rock, Hastings. 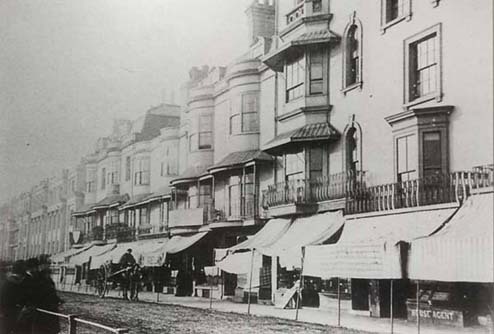 Situated on Hastings seafront, White Rock Place was the site of a large number of photographic portrait studios during the Victorian and Edwardian period. Given the prime location of White Rock Place, the buildings that overlooked the seafront at Hastings were occupied by lodging houses and other businesses which would attract visiting holiday makers. [ABOVE] The imprint of the Rapid Art Photography of 56c Terminus Road, Eastbourne as printed on the reverse of a postcard portrait (c1907). 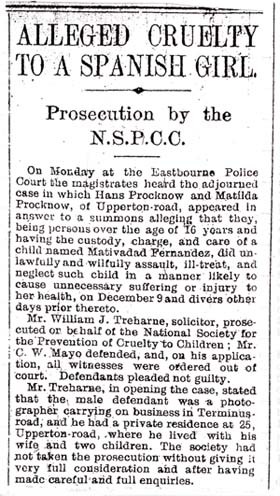 [ABOVE] An extract from a report in the Eastbourne Gazette dated 2nd February 1910 detailing how Hans Prochnow (wrongly spelt as "Procknow" in the newspaper article) and his wife Matilda Prochnow were charged with assaulting and ill-treating Mativadad Fernandez, a 12 year old Spanish girl who had come into their care. Hans Prochnow, a photographer with a portrait studio at 56c Terminus Road, Eastbourne, was acquitted, but his wife Mrs Matilda Prochnow was fined for her cruelty to the child. The newspaper article names Hans Prochnow's studio assistant as John Herbert. 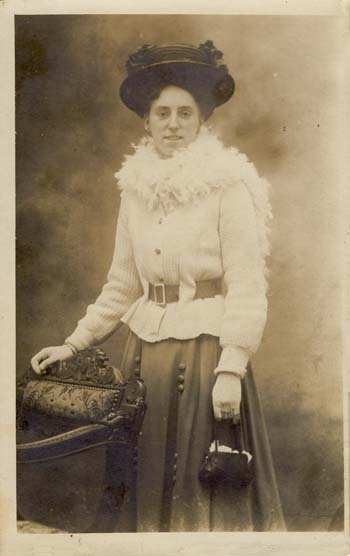 The report of the court proceedings mentions that Mrs Matilda Prochnow arrived in England from Spain around 1904. The R. A. P. (Rapid Art Photography) Gallery was opened in Eastbourne in 1907. The photographic studio at 56c Terminus Road, Eastbourne was eventually placed under the management of Hans D. Prochnow, a photographer from Germany. Hans Detlof Prochnow was born in Germany around 1880. It appears that Hans Prochnow had arrived in Eastbourne as a young man during the early 1900s. Hans Detlof Prochnow married a Spanish woman named Matilda De Montilla (born c1883) at Eastbourne in 1905. [The marriage of Hans Detlof Prochnow and Matilda De Montilla was registered in Eastbourne during 3rd Quarter of 1905]. A year into their marriage, Hans and Matilda Prochnow became the parents of a baby girl. [The birth of Juanita Matilde Prochnow was registered in Eastbourne during the 3rd Quarter of 1906]. A second daughter, Pilar Carmen Prochnow, arrived during the early months of 1908. 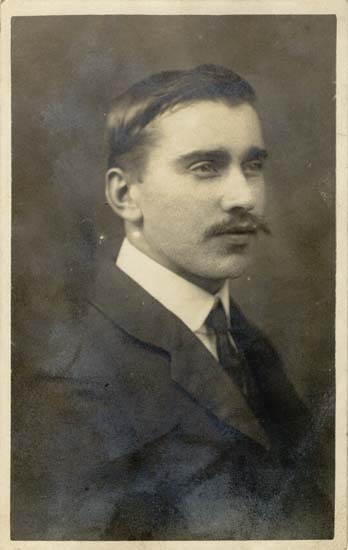 The couple's third child, a son named Manuel T. Prochnow was born in Eastbourne in the February or March of 1911. Around 1907, Hans Prochnow was recruited by De Jornette Plummer of Rapid Art Photography to run a R. A. P. Gallery at 56c Terminus Road, Eastbourne. A second R. A. P. Gallery was opened in the town at 46 Seaside Road, Eastbourne around 1910, under the London photographer Joseph Robert Lizars (born 1872, Islington, London). Between 1909 and 1910, Hans Prochnow and his family were living at 25 Upperton Road, Eastbourne. By the time the census was taken on 2nd April 1911, Hans Prochnow, his wife Matilda and their children had moved to the outskirts of the seaside resort. The 1911 census return records Hans Prochnow as a 30 year old "Artist and Photographer", living with his wife Matilda and their three young children - Juanita, aged 4, Carmen, aged 3 and one month old baby Manuel - at 7 Lewes Road, Eastbourne. Hans Prochnow remained in charge of the R.A.P. Gallery at 56c Terminus Road, Eastbourne until around 1914. By this date, De Jornette Plummer had ended his involvement in the R. A. P. (Rapid Art Photography) business and had left Brighton. (The studio at 59 King's Road, Brighton was taken over by a photographer named A. W. Newnham). 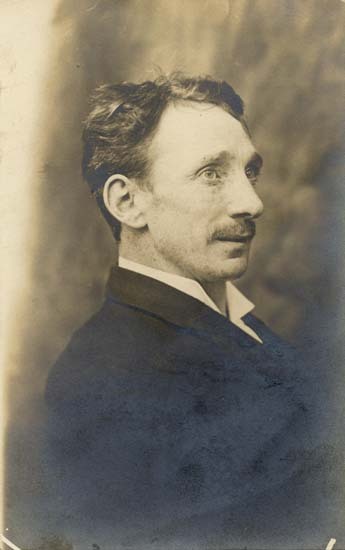 The advent of the First World War might have forced the German-born Hans Prochnow to give up his photographic studio in Eastbourne. (H. D. Prochnow was last recorded as a photographer at 56c Terminus Road, Eastbourne in the 1915 edition of Kelly's Directory of Sussex, but trade directories were generally compiled during the year preceding publication). I have found no trace of Hans Prochnow after 1915, but his daughter Juanita Prochnow was living in Hendon when she married Herbert S. Price in 1932. Hans Prochnow's son Manuel T. Prochnow married Sonia M. S. Hooper in the London district of Westminster in 1947. 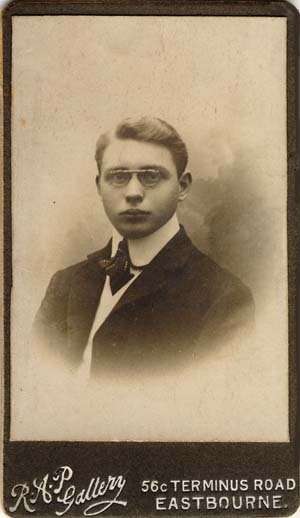 [ABOVE] A carte-de-visite portrait of a man wearing pince-nez eyeglasses, photographed at the Rapid Art Photography Gallery at 56c Terminus Road, Eastbourne (c1907). A R. A .P. Gallery portrait in carte-de-visite format is rare as most of the studio's output was in the form of postcard portraits. 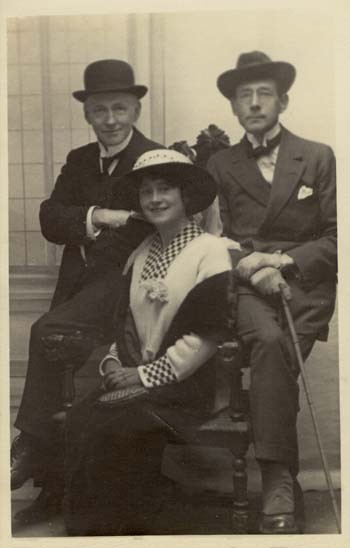 [ABOVE] Hans D. Prochnow and De Jornette Plummer recorded in the list of professional photographers in the 1909 edition of Kelly's Directory of Sussex. D. J. Plummer operated the Rapid Art .Photography (R. A. P.) .Gallery at 59 King's Road, Brighton, and H. D. Prochnow managed the R. A .P. Gallery at 56c Terminus Road, Eastbourne. 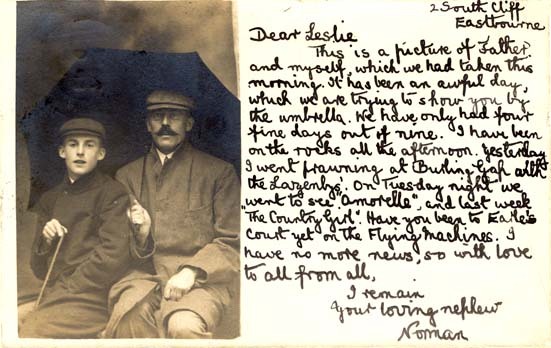 [ABOVE] A postcard portrait of a boy and his father sheltering under an umbrella, photographed at the Eastbourne studio of Rapid Art Photography at 56 Terminus Road, Eastbourne (1904). Norman, the boy who sent the postcard in September 1904, makes a reference to "Flying Machines" at Earls Court. [ABOVE] The reverse of the Rapid Art Photography picture postcard illustrated on the left. The photograph credit is given to Rapid Art Photography, 56 Terminus Road, Eastbourne. The postcard carries a postmark date of 8th September 1904. 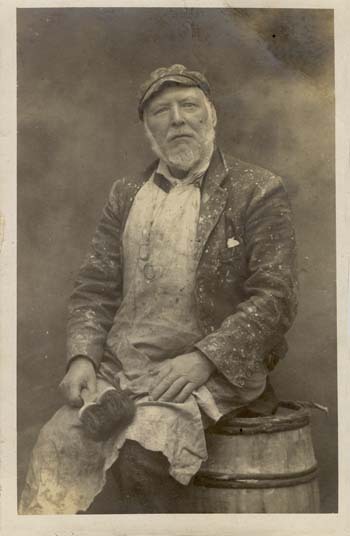 [ABOVE] A postcard portrait of a painter & decorator, photographed at the Eastbourne branch of Rapid Art Photography (c1908). The reverse of this picture postcard is labelled "Souvenir of Eastbourne" and gives the studio address as RAPID ART PHOTOGRAPHY, 56 Terminus Road, Eastbourne. [ABOVE] A postcard portrait of an unknown woman, photographed at the Eastbourne branch of Rapid Art Photography (c1907). The reverse of this picture postcard is labelled "Souvenir of Eastbourne" and gives the studio address as RAPID ART PHOTOGRAPHY, 56 Terminus Road, Eastbourne. 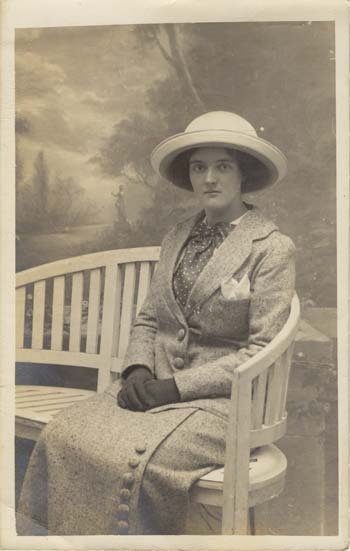 [ABOVE] A postcard portrait of a seated woman, photographed at one of the Eastbourne branches of Rapid Art Photography (c1911). The reverse of this picture postcard gives two studio addresses - 46 Seaside Road and 56 Terminus Road, Eastbourne. [ABOVE] A group portrait photographed at the Eastbourne branch of Rapid Art Photography (c1910). The reverse of this picture postcard is labelled "Souvenir of Eastbourne" and gives the studio address as RAPID ART PHOTOGRAPHY, 56 Terminus Road, Eastbourne. 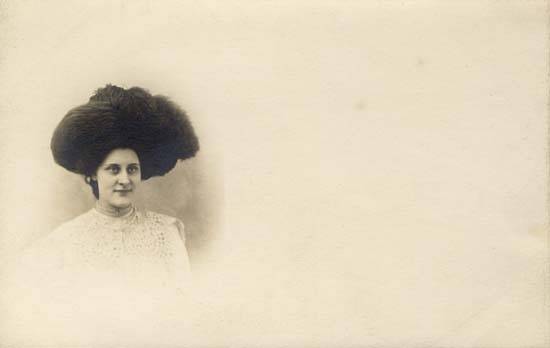 [ABOVE] A postcard portrait of a woman wearing an unusual hat, photographed at the Eastbourne branch of Rapid Art Photography (c1910). The reverse of this picture postcard is labelled "Souvenir of Eastbourne" and gives the studio address of the studio as Rapid Art Photography, 56 Terminus Road, Eastbourne. [ABOVE] A postcard portrait of a seated woman, photographed at the Eastbourne branch of Rapid Art Photography (c1910). The reverse of this picture postcard is labelled "Souvenir of Eastbourne" and gives the studio address as RAPID ART PHOTOGRAPHY, 56 Terminus Road, Eastbourne. 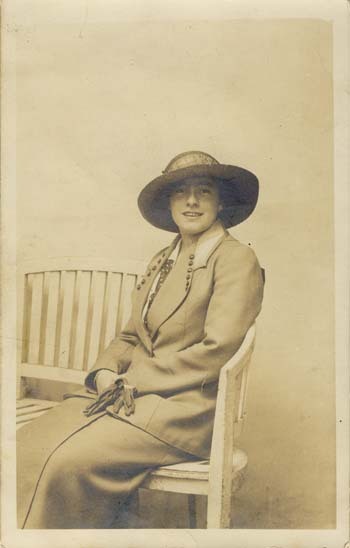 [ABOVE] A postcard portrait of a young woman wearing a fancy hat, photographed at the Rapid Art Photography studio at 42 High Street, Croydon. This postcard was probably produced around 1904 . The space alongside the vignetted portrait could be used to write a message. 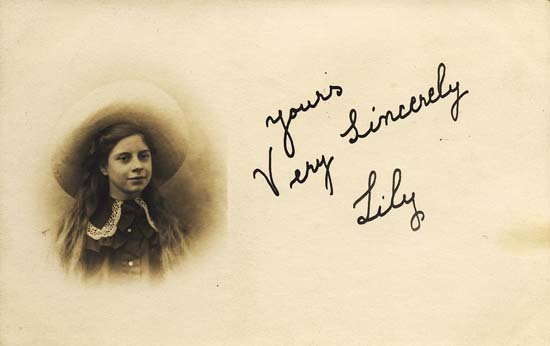 In the early 1900s, messages were generally written on the picture side of the postcard. Post Cards with "divided backs" were introduced into Britain in 1902, after the Post Master General relaxed postal regulations and permitted the side of the card which carried the postage stamp to be used for both the hand-written message and the postal address. Although made obsolete by the introduction of "divided back" postcards, De Jornette Plummer, the proprietor of Rapid Art Photography, retained this type of postcard portrait for a couple of years after the introduction of the new style postcard. (See opposite) [ABOVE] The reverse of the picture postcard portrait shown opposite. 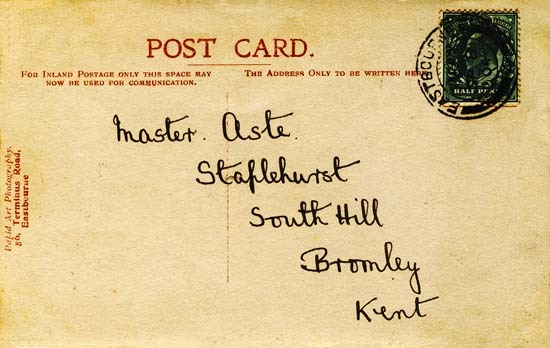 This post card was produced at the Rapid Art Photography studio at 42 High Street, Croydon around 1904. 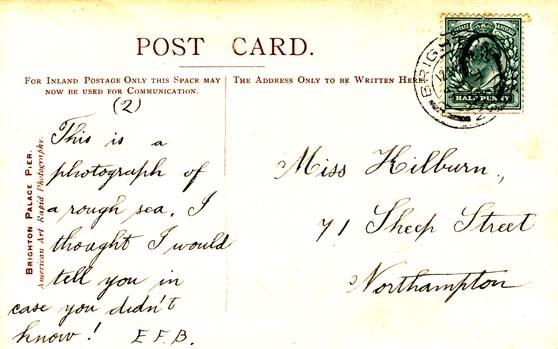 In the period 1902-1903 messages were generally written on the picture side of the postcard and the side which carried the postage stamp was reserved for the postal address. 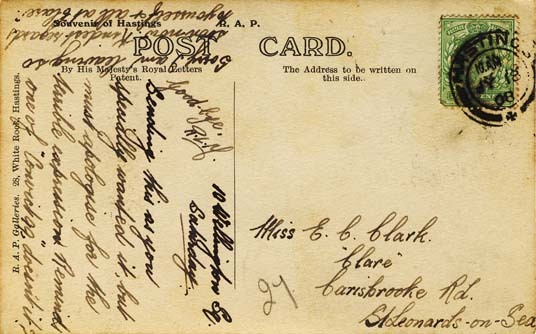 This postcard, however, has a "divided back", which allowed the postal address and a written message to share one side of the card. Around 1902, the Brighton-based photographer De Jornette Plummer had perfected the technique of producing a photographic portrait alongside a space which could be used for a written message. Even after the introduction of postcards with "divided backs" in 1902, D. J. Plummer, the proprietor of Rapid Art Photography, continued to employ his "picture and message" postcard format for portrait photographs. 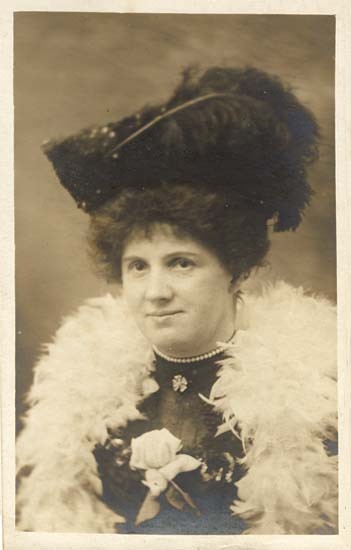 [ABOVE] The photo credit on the reverse of a picture postcard portrait produced at the Rapid Art Photography studio at 27 Sandgate Road, Folkestone (c1910). 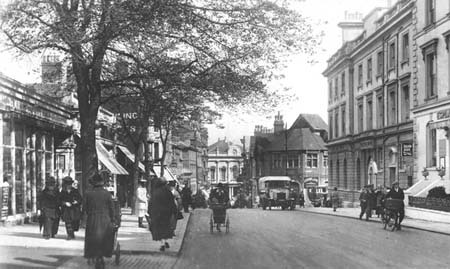 [ABOVE] Sandgate Road, Folkestone photographed in the 1930s. [ABOVE] A postcard portrait of a young couple photographed at the R. A. P. (Rapid Art Photography) Gallery at 27 Sandgate Road, Folkestone (c1910) [ABOVE] The reverse of the picture postcard portrait shown opposite. This post card was produced at the Rapid Art Photography studio at 27 Sandgate Road, Folkestone around 1910. [ABOVE] A photograph of Peter Robinson's Department Store at 200-236 Oxford Street, London in the 1930s. The Rapid Art Photography (R.A.P.) 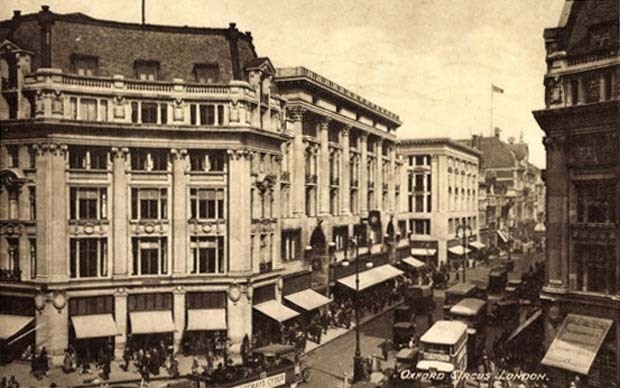 company operated a studio at Peter Robinson's clothing store around 1914. [ABOVE] "A Sale Day at Peter Robinson's"(c1907). 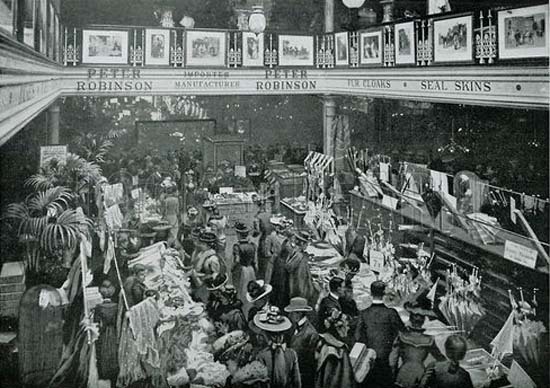 Peter Robinson's was a large department store situated in London's Oxford Street. Around 1914. the Rapid Art Photography (R.A.P.) company opened a photographic portrait studio inside Peter Robinson's store. 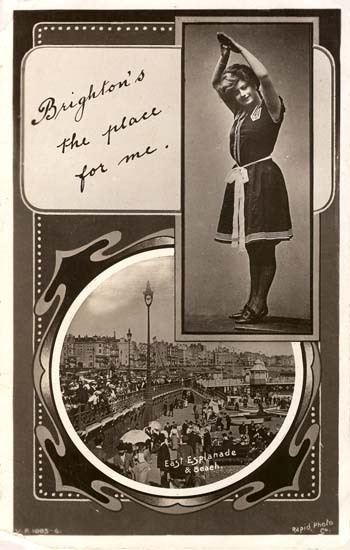 [ABOVE] "Brighton's the Place for Me", a picture postcard published by the Rapid Photo Printing Co. Ltd. London (1912). The circular frame contains a photograph of the East Esplanade & Beach at Brighton. During the first decade of the 20th century, many postcard publishers adopted the word "Rapid" for their trading names. This company had no connection with R. A. P.